Last Tuesday, we were able to get a glimpse of how dynamic freshmen can make an immediate impact in college basketball. We also saw extraordinary talents in Andrew Wiggins, Jabari Parker and Julius Randle who represent the future of the NBA. Five ranked teams were in action Friday, including number one to be Michigan State, but that was hardly on the minds of many college basketball fans. Friday featured seismic announcements from four of the top high school basketball recruits in the country. Duke will be loaded next year with Okafor and Jones coming in as a package deal. They are the perfect compliments. A pass first, true point guard and a dominant low post big man along with returners mean big things for Duke next year. Illinois or Kansas? His choice was Kansas, but not before he mistakenly picked up the Illinois hat at first at his announcement. You know this one is hurting in Champagne, Illinois but for now, Kansas will plan on doing great things with Alexander. Arizona got Aaron Gordon in last year’s recruiting class, now they have another stud to follow. Johnson is a great scorer and has the tools to make an immediate impact in an Arizona program that seems to be back near the top. Michigan State, coming off a huge win in Chicago against #1 Kentucky, struggled with a tricky Columbia squad for thirty-five minutes. The Spartans were able to pull away in the final minutes and finished with a 64-53 win. The fact that this game was this close is shocking. The Badgers overcame a seven point second half deficit to defeat Green Bay on Saturday. Green Bay junior Keifer Sykes scored a career high 32 points but it wasn’t enough against Wisconsin, who was lead by Frank Kaminsky’s 17 points. 52-35? Sounds like Peyton Manning just lead the Broncos to a win. However, Ohio State limited Marquette to 35 points due primarily to the great performance of Aaron Craft (10pts 7 reb 10ast 2stl). Marquette shot just 19% from the field in the defensive struggle. The Sycamores had five players score in double figures as their balanced attack outlasted Notre Dame 83-70 in South Bend. Notre Dame received solid production from their starters but the bench could not contribute much as the Irish were sent to their first loss. Another upset on the road. Belmont went into Chapel Hill and defeated the Tar Heels 83-80 on the shoulders off J.J. Mann (28 points). UNC got a terrific effort from James Michael McAdoo who had 27 points and 13 rebounds. This was one of three home losses on the day for teams in the ACC. Not that this was not an upset; Michigan is a very good team, but Iowa State does have something brewing in Ames. #7 Michigan’s Mitch McGary made his season debut Sunday but in a losing effort, as the Cyclones defeated them 77-70. Melvin Ejim led Iowa State with 22 points. The twenty-four hour ESPN College Basketball Tip-Off Marathon has concluded. College basketball is officially back. If you tuned in at any point during the marathon, you would think it is in midseason form. Four of the top five teams played, four matchups featured two ranked teams facing one another; new rules, a ridiculous freshman class, and great coaches…what else is their to say? This could have been a great week; we got it in one day. Don’t go anywhere now because March will be here before you know it. BYU 112 – Stanford 103: The two started off the marathon with a shootout, as BYU was able to outlast Stanford with hot shooting down the stretch. BYU will look to challenge Gonzaga as the new team in the WCC. #16 Wichita State 66 – Western Kentucky 49: The Shockers shocked everybody by making it to the Final Four this year. This team will be a force again as they pulled away from WKU in the second half. Quinnipiac 67 – La Salle 73: La Salle was able to battle back and defeat Quinnipiac after dropping their season opener. After an improbable run to the Elite 8 last year, La Salle will try to repeat their March success after losing just one player from last year’s team. LSU 90 – Massachusetts 92: A close game throughout, UMass was able to edge out a win against LSU with good free throw shooting and 24 points from their leader Chaz Williams. West Virginia 82 – Virginia Tech 87: An odd game. WVU jumped out to a big lead in the first half but Va. Tech responded with a 34-9 run that put them in the lead for good. Freshman Ben Emelogu is a name to keep an eye on for VT.
South Carolina 74 – #23 Baylor 76: Baylor somehow pulled out a victory while not scoring in the last seven minutes. Sharpshooter Brady Heslip led the Bears with 18 points as they held on against Frank Martin’s Gamecocks. NC State 57 – Cincinnati 68: Both of these teams were ranked consistently throughout the 2012-2013 season but both seem to be in a little bit of a rebuilding mode. Cincinnati was able to pull away because of its leader Sean Kilpatrick. #14 VCU 59 – #25 Virginia 56: A close game throughout came down to the final seconds. VCU’s Treveon Graham nailed a three with just over a second left to secure a victory against a game Virginia team led by Joe Harris (18 points). #11 Florida 53 – #20 Wisconsin 59: A classic Badger grinder. Bo Ryan preaches defense and his Badgers were able to control the tempo. Keeping games in the 50s bodes well for Wisconsin, who was led by Ben Brust. Baylor may not be as good as we thought. Wisconsin will always be Wisconsin, a hard-nosed, tough and rugged team. 68 NBA representatives attended the two games in Chicago. Four of the top five teams in the country, the top three freshmen in the country, WOW. It is safe to say that The Champions Classic did not disappoint. It was experience against youth, and experience won. Kentucky started four freshmen and a sophomore while MSU countered with two seniors, a junior, and two sophomores. Michigan State came out firing, jumping out to quick 10-0 lead. The Spartans dominated the first half from start to finish, leading 44-32 at the break. Kentucky’s star freshman Julius Randle was held to 4 points on 1 of 5 from the field while MSU’s Gary Harris and Adreian Payne combined for 27 points on 10 of 14 from the field. The Spartans were out and running early and often and their defense was smothering. Kentucky seemed out of sorts on both ends. The second half was a different story. Payne got in early foul trouble for the Spartans, which allowed Randle to get loose. Randle had a monster second half and finished with 27 points and 13 rebounds. Kentucky’s confidence began to grow and it carried over to the defensive end. Michigan State became stagnant on the offensive end as Kentucky battled back, finally tying the game at 66 before the Spartans took the lead back for good. Branden Dawson’s tip in with about 5 seconds left sealed the deal for Michigan State. In my game preview I said that Michigan State had to take care of the ball and Kentucky must rebound. Oddly, both did an outstanding job, respectively. Michigan State only turned it over seven times while Kentucky coughed it up 17 times. However, Kentucky shockingly outrebounded MSU 44-32. Something had to give. The 17 turnovers by Kentucky were the difference. They often turned into fast break points for the Spartans, especially in the first half. Transition defense was a clear weakness of the Wildcats. UK clawed back into the game and finally broke even at 66. However, Michigan State answered as Denzel Valentine found Keith Appling for an open three in the corner. Gary Harris stole the ensuing inbounds pass and hit a driving layup to reclaim a five-point lead for the Spartans. MSU: Keith Appling (PG) 22 points, 8 assists, 8 rebounds. Michigan State is the best team in the country as of November 13th. Gary Harris is not just the top candidate for Big Ten Player of the Year; he is one of the best players in the country. He is a solidified NBA Lottery pick. Michigan State goes as the transformed and improved Keith Appling goes. This team has as good of shot as anyone to make the Final Four. Kentucky is again inexperienced, but they are tough. This team will be just fine and will only get better. Julius Randle is undoubtedly the best player and leader for Kentucky. Simply put, he is a beast. Kentucky’s strength is attacking the rim; they are not a great three point shooting team (4 for 20 from distance). Final Four good without a doubt, if they start playing a “more together” type game, the sky is the limit. Do not let the final score fool you. This was a close game throughout. It was back and forth with the two exchanging leads constantly. It was once again a battle of experience and youth. Duke’s starters included a senior, a junior, a third year sophomore (via transfer), a true sophomore and a freshman. Bill Self played seven freshmen in his rotation Tuesday. An even game throughout, neither team established a clear edge early. One thing that was a constant was the execution of Kansas. We saw many instances of Bill Self’s greatness as a coach last night, first with a beautifully designed backdoor out of bounds play for Andrew Wiggins. Speaking of Wiggins, he only played nine minutes in the first half. While Kansas executed, Jabari Parker took on the role of assassin for Duke. Parker was the lifeline for Blue Devils. He did everything. Defensively he was active, he was hitting from deep, and making acrobatic finishes at the rim. The second half featured the same back and forth action until finally Kansas made its move at the end. Wiggins who finished with 22 (16 in the second half) made crucial plays down the stretch including a step back jumper and a dunk in transition, which fouled Jabari Parker out of the game. Kansas also received breakout performances from big man Perry Ellis (24 points and 9 rebounds) and Wayne Selden Jr. (15 points). Kansas outrebounded Duke 39-24, as Parker’s 27 points and 9 rebounds were not enough. Kansas received many contributions from many different players in a winning effort Tuesday. Wiggins did not disappoint with 22 points, but the “other guys” were a huge reason why Kansas played so well. Perry Ellis and Wayne Seldon Jr. helped lead the charge for KU and Frank Mason and Naadir Tharpe helped pace the Jayhawk backcourt. On the other hand, Duke did not defend Kansas too well. Kansas’ execution often beat Duke’s defensive pressure. I was particularly impressed with the Jayhawk guards and their ability to get the ball into the paint, whether by entry or dribble drive. Not a tough one here. Andrew Wiggins put the Jayhawks in front for good in the last five minutes with multiple plays on both ends. His step back jumper and transition dunk put Duke away for good. Jabari Parker can do it all; Duke will rely on him heavily all season long. He is special, period. Duke will need better contributions from their bigs going forward. Kansas outrebounded them 39-24 and Perry Ellis dominated them in the paint. Duke has perhaps the most scoring depth of anyone in the country. Parker, Hood, Thornton, Sulaimon, Cook, etc. These guys can fill it up. Duke is still a candidate to make the Final Four, but there are some concerns as of now with rebounding and defense. Expect them to improve in both areas. Bill Self is a great coach. Okay we didn’t just learn this, but I was shocked at the execution of Kansas. Coach Self had his boys ready to play. Kansas, although young, will be just fine. Their freshman, Wiggins, Selden and Frank Mason in particular, were very poised. Perry Ellis is becoming a star. He was named to the All-Tournament team last April and he is picking up where he left off. When he plays like this, KU will be a tough out. Kansas is once again a Final Four contender, and should win the Big 12 for a 10th consecutive season. The quality of play we saw over the course of the twenty-four hour marathon was impressive. There are so many good teams with so much talent. This should be an exciting and iconic year in college basketball. The game will be the earliest ever matchup between #1 and #2. Previously the earliest was November 29th. Kentucky’s freshman class, regarded by many as the best class ever, battles against its first ranked opponent. TAKE CARE OF THE BALL. Michigan State opening the season with major problems in the turnover department has seemed to become an annual event. Oddly, as March approaches these problems are typically solved, but to beat a team with the talent of Kentucky, turnovers cannot happen. Easy baskets will feed confidence to this young Wildcat team, and that’s when they will really start rolling. Michigan State needs to be efficient on offense lead by the evolving Keith Appling on the point guard position. Making life tough on Kentucky may show their inexperience. REBOUND. We all know Michigan State will rebound at a high rate on both sides of the ball. Kentucky’s toughness will be tested most on the boards. For the Wildcats to win, they MUST compete on the boards, especially on the defensive end. 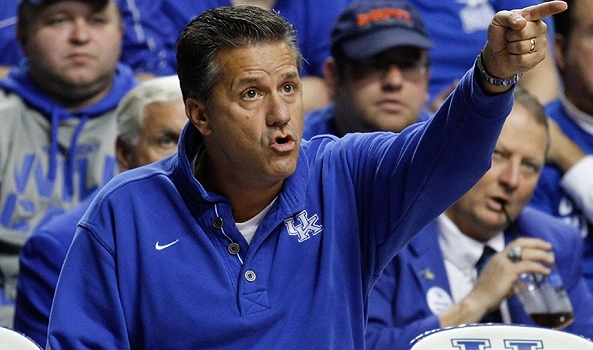 If Michigan State imposes its will on the offensive boards, Kentucky will have a hard time. Extra possessions for the likes of Harris and Payne are bad news. The Wildcats have the athletes to rebound effectively, but with their inexperience, they have yet to see a machine like they will see tonight. Expect the team that controls the boards to have the inside track to win this game. Randle is undoubtedly the pulse of this Kentucky team, posting double-doubles in both of his first two games. If Michigan State can contain him and make him work on the defensive end it can be successful. On the flip side, if Randle gets into a rhythm early and attacks the boards like he has been, Kentucky could build confidence early and turn that into success. Michigan State- Keith Appling, PG: This year will be Appling’s third year at the point. Entering his sophomore year he transitioned from the off guard position. If he can take care of the ball, provide some scoring, and distribute to Harris and Payne, Michigan State can come out of Chicago with a win. Kentucky- Willie Cauley-Stein and Dakari Johnson, C: One seven foot center is dangerous, who knows what the possibilities are when a team has two. Kentucky does. You know Izzo wants to establish his guys in the paint early. If these two can provide rebounding and rim protection, Kentucky will be in great shape. Coach K 3 – Bill Self 0: Self has lost all three matchups against Duke. Another 1 v 2: Andrew Wiggins and Jabari Parker, the top two recruits coming into this year, battle for the first time at the college level. HAVE SECONDARY SCORING. Kansas cannot rely on Andrew Wiggins to carry them. Duke will attack in waves with different players. Having point guard Naadir Tharpe back from a one game suspension will surely help the Jayhawks, but Kansas needs a group effort. Cue Perry Ellis and Tarik Black. Ellis really started to come on toward the end of last season while Tarik Black, a transfer from Memphis, has the potential to dominate a game in the paint. If Kansas can feed these two guys on the block and score early, Kansas can open up opportunities for Wiggins and fellow freshman Wayne Seldon Jr. to make plays. Hold on a minute. We get to see #1 and #2 play at 7:30, and it might get better at 9:30? 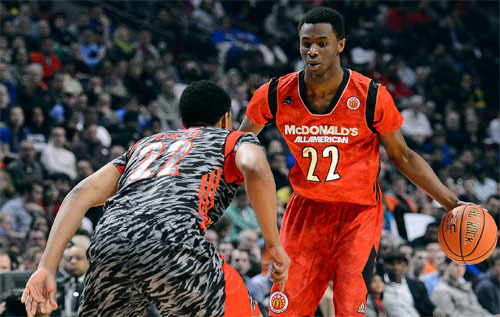 Wiggins and Parker may be the BEST matchup of individuals we will see all year long. 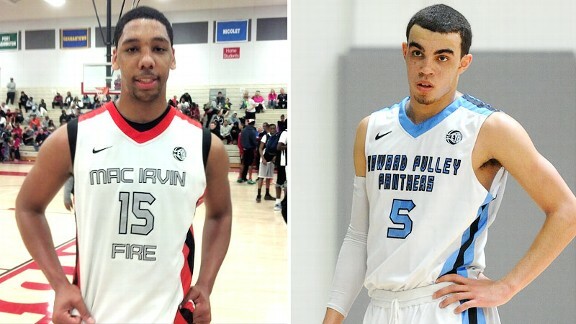 Parker was the number one recruit for so long until Wiggins skyrocketed past him. Does a small rivalry exist here? Maybe. What we do know is that two of the best freshmen and players in America will matchup against each other tonight in Chicago, and the winner of this matchup puts his team in a great position to get a meaningful early season win. This is a must see, period. Duke- The Bigs: Discounting Parker whose versatility will have him in different spots, Duke’s big men accounted for only 15 of its 111 points in its opening game win vs. Davidson. Amile Jefferson and Josh Hairston in particular, need to provide rebounding, toughness, and more offensive output. With incredible scoring and versatility from its guards, Duke will cruise if this happens. Kansas- Andrew White III, G/F: This 6-6, 210 sophomore chipped in 12 points in Kansas’ first game. More importantly he nailed 3-5 attempts from beyond the arc. Kansas does not have a bevy of shooters to rely on, so if White can come off the bench and make shots, pressure will be taken off the shoulders of Wiggins. If White is in rhythm and Kansas decides to attack from the inside out, Tarik Black and Perry Ellis will have a great spot up option to kick out to. The Final Four In November? The kind of college basketball that fans will be treated to tonight in the third annual Champions Classic isn’t supposed to happen until early April. Only a few days into the college basketball season, the Champions Classic might just be a sneak preview of the Final Four. Top-ranked Kentucky vs. No. 2 Michigan State is the marquee matchup in the tournament tonight at the United Center in Chicago. It’s the earliest in the season the top two teams have faced each other, and the first game between Nos. 1 and 2 since 2008. Duke and Kansas play in the nightcap, giving the tournament four of the top five teams in the country. Before we delve deeper into the individual matchups, it’s worth looking at some of the numbers surrounding this event. Kentucky, Kansas and Duke are three of the four all-time winningest programs, and the four schools have 17 national titles between them. Furthermore, the Wildcats, Spartans, Jayhawks and Blue Devils have been to 24 Final Fours in the past 21 years. It’s safe to say we are talking about college basketball royalty here. Kentucky leads the all-time series against Michigan State 12-10, but the Spartans won the last meeting in the 2005 NCAA tournament in a double-overtime classic. Both teams dominated their respective season opener, with the Wildcats throttling UNC-Asheville and the Spartans handling McNeese State. The battle for the top spot in the country is a classic showdown between experience and raw talent. John Calipari assembled arguably the best recruiting class in the history of the sport and will be relying on those freshmen all season, while Tom Izzo’s trio of Keith Appling, Gary Harris and Adreian Payne give the Spartans leadership that is needed to succeed in marquee contests. Were this matchup to take place again in March, Kentucky’s incredible depth and ability could be enough. However, it is going to take some time for the Wildcats to reach their full potential with so many young players on the floor at once, and Michigan State will take advantage. Look for Appling and Harris to suffocate the Harrison brothers on the defensive end, forcing critical turnovers in the process. The Spartans will convert the subsequent opportunities in transition into easy baskets. But it’s not just the harassing defense Michigan State plays that will give Kentucky trouble. You would be hard pressed to find a more physically dominant squad in the country and on the boards than Izzo’s bunch. Between the Spartans’ defense and proclivity for contact, the young Wildcats will grow frustrated by late in the second half. Duke leads the all-time series against Kansas 7-2, a mark which includes a victory in the most recent matchup in the 2011 EA Sports Maui Invitational title game. You’ve heard all the cliches—there’s no “I” in team, basketball is a team game, it’s not about individual matches, etc. In fact, if you talked to Bill Self, Mike Krzyzewski or either of their prized freshmen in the days leading up to this game, you would probably hear those same cliches again. But fans don’t have to live in the boring world of coach speak. The headlines following this matchup will undoubtedly focus on the battle between Wiggins and Parker. And how could they not? We are talking about the presumed No. 1 pick in the next NBA draft in Wiggins and a freshman who was already on the cover of Sports Illustrated in high school and called the best prospect since LeBron James in Parker. While the freshmen showdown may be the story, the talent surrounding Parker will make the difference in this game. Quinn Cook, Rasheed Sulaimon, Rodney Hood and even Amile Jefferson are a more formidable surrounding cast at this point of the year than Andrew White III, Wayne Selden, Tarik Black and Perry Ellis. The Jayhawks, in a similar fashion to Kentucky in the first contest, are very talented but don’t quite have the experience to win this game at this point in the year after replacing all five starters (the story will be different in March for both squads).